You can purchase a wood lathe in many sizes. On the small side are bench-top mini lathes with motors as small as 1/3 HP. These lathes weigh less than 50 pounds (23 kg). On the large side are lathes with 3 HP motors weighing over 900 pounds (408 kg). As the name suggests, a wood lathe turns wood. However, some turners also use their wood lathes to turn antlers, acrylics, laminates, nuts, banksia pods, alabaster, etc. A wood lathe spins the workpiece, while you move cutting tools by hand to create smooth curves and contours. There is a variety of lathes on the market today. Most turners will recommend that you buy the biggest lathe you can afford. Since you can turn tiny pieces on a big lathe, but you cannot turn large pieces on a small lathe. When purchasing a lathe, it is also important to look for a lathe with a standard spindle size, threads, and tapers. This will make it easier to find accessories. Following are some helpful tips on wood lathes. 1. Know how to measure the “swing” of a wood lathe. Realize on many lathes, the “swing over the tool rest” might be several inches less than the “swing over the bed”. On some lathes the banjo might be 2” (5cm) or more in height. For example, in the image below the lathe has a 16” (41cm) swing. (The swing is twice the distance from the bed of the lathe to the center of the spindle.) If you want the banjo under the workpiece, then the maximum piece that you can mount would be less. For this particular lathe, it might be only 12” (30cm) in diameter. 2. 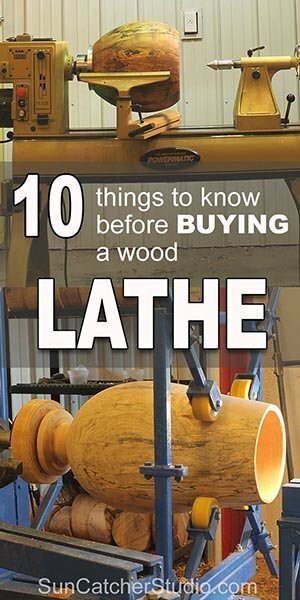 Know how to measure the “size” of a wood lathe. Realize you will most likely not be able to turn a workpiece as long as the specified “size” of the lathe. The size of the lathe is the distance from the headstock to the tailstock (i.e., “distance between centers“). The size of the lathe illustrated is 42” (107cm). However, do not expect to turn a piece that long. This dimension does not include any accessories in either the headstock or the tailstock (e.g., a drive center or live center). On my lathe with an advertised 34½” (88cm) distance between centers, the maximum length that I can turn is 27½” (70cm) – with a drive center in the headstock and a live center in the tailstock. You can slightly extend this maximum length by having the headstock and/or tailstock overhang the bed of the lathe. 3. Purchase live centers with a standard angle. Almost all wood turning centers have an angle of 60°. A 60-degree point angle has become the standard (at least in the U.S) because this angle is very durable, and yet still can accurately position and hold the workpiece on the lathe. 4. Know the most common tapers sizes. On wood turning lathes the most common accessories are either MT1 (Morse Taper #1) or MT2 (Morse Taper #2). So when purchasing a lathe, always look for a lathe where the taper on the headstock and tailstock is MT1 or MT2. Shown below are some accessories that have a MT2. Note: Some manufactures use the term 2MT as opposed to MT2. Collection of accessories with Morse tapers. 5. Know how to determine the “Spindle Thread Size” of a lathe. Faceplates, chucks, and other accessories come in a variety of spindle thread sizes. Knowing the spindle thread size on your lathe will help ensure you purchase the correct accessory or adaptor. Shown below is a spindle thread specification of 1¼” x 8. This indicates the outside diameter of the spindle is 1¼” and it has 8 threads per inch. A 1¼” x 8 spindle has 8 threads per inch. 6. Understand how a Morse taper works. A Morse taper is a self-holding machine taper. It can securely hold live centers and drive centers in either the headstock or tailstock. The friction of the surfaces and the wedging action of the taper holds it in place. The angle of the taper varies slightly from one Morse taper number to the next. As a specific example, a Morse Taper #2 has a 0.0500 taper per inch. Resulting in 1.43 degrees as shown below. To remove a Morse taper accessory from the headstock, light tab it with a knockout bar. To remove accessories from the tailstock, fully withdraw the quill into the tailstock releasing the accessory. 7. Know the different types of centers. You insert a “live center” or “dead center” into the tailstock when turning between centers to press and hold the workpiece. A live center contains ball bearings that allow the center to rotate along with the workpiece. A dead center remains stationary in the tailstock and does not rotate with the workpiece. When using a dead center, many turners will apply some form of lubrication to keep the piece from squeaking as it turns. On the other hand, you typically insert a “drive center” into the headstock of a lathe to bite into the wood and transfer the rotational force to the workpiece. 8. Consider purchasing a lathe with electronic variable-speed. The electronic variable speed makes it easy to change the speeds. The digital RPM readout makes it easy to keep track of your exact spindle speed. In addition, the multi-range pulleys provide maximum torque at various speeds. As shown below, by opening the access door on the headstock, and loosening the tension, you can reposition the belt in either the low or high RPM setting. 9. Consider purchasing a lathe that has a phase converter. Better lathes use an inverter to convert 1 phase into 3 phase electric power. Three phase motors produce almost a constant or uniform torque at various speeds, in particular at lower speeds. On the other hand, single-phase motors produce a pulsating torque and have less torque at lower rpms. 10. Consider using the lathe for clamping. Don’t forget about using the tailstock of the lathe for clamping pressure when gluing segmented rings together. A few common lathe brands include Delta, General International, Grizzly, Jet, Nova, Powermatic, PSI, Robust, Rockler, Shop Fox, Woodtek. interesting to feel that you need lots of money to buy a good lathe – yes there is no doubt that quality pays but there are a great many old lathes going for very little with dont have electronic variable speed. Same with the tools – How many tools do you really need? The great push is to get the latest – but 90% of the time you can make do very well with 3 tools – small bowl type/spindle gauge, standard parting tool and a skew for “occasional use. While I agree you can probably get by with 3 tools, unfortunately, my will power is very weak when I am WoodCraft! Bill reminds me off a fisherman who must have the latest lure. I was like that till I sat one day in a fishing shop watching what goes on. Some lures never see the water but you gotta have it. This is the very first time I frequented your web page and thus far I am surprised with the research you made to make this particular publish amazing. Magnificent job! Thank you for the informative blog. Where else may I get that kind of info written in such an ideal method? I have a mission that I am just now operating on, and I’ve been at the look out for such information. I need a lathe! I have had a lathe but Katrina took it away. I have experience. I was once a shop teacher many years ago. I need some advice on what to buy? I am about to retire. I need a serious hobby. I’ve made many pens. it has been a long time. Please advise on a lathe that is not too small and not huge! Gary, if money is no issue, I would go with a Robust lathe. These lathe come with a stainless steel bed (ways). My second choice would be either a PowerMatic or Jet lathe. Personally, I own two PowerMatic lathes, and I have had no problems with either of them. Thank u. Just thank u for making this easy and informative. 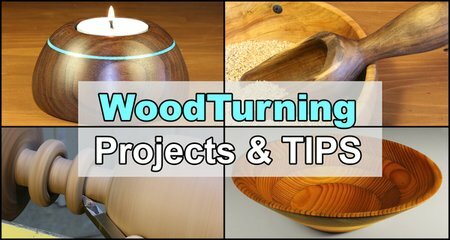 It’s full of valuable information for someone like me who is new to woodburning. I was lucky enough to pick up a lathe that a local factory was giving away to anyone who could lift it into their truck. I love this thing, but am teaching myself. Which can b hard but I am sure to learn from all of the folks out there like u who have taken time out of ur busy day for others. Thanks again and may God bless u.